I call it bragging rights! As I have posted here before my sport psychology program is a mixture of cognitive behavioral therapy, imagery rehearsal, relaxation, hypnosis and other tools designed for self actualization. When a client comes to my office, one of the first things they learn is that we start to focus on the positive things that happen in their lives. I borrowed the term “Bragging Rights” from a friend and psychotherapist by the name of Rick Wyckoff. I say borrowed, but of course I mean stole, as I didn’t ask his permission. But Rick is always generous, so I doubt that he will mind. I have of course been using the exercise for a couple of decades or more, but the name is remarkable to me. We spend so much time telling people they shouldn’t brag. That bragging is somehow rude or socially unacceptable. I wish we spent as much time teaching people that being negative so much was also in this category. It is much easier for most people to talk about what a bad day they are having then to talk about how great their life is. And that is in fact where a lot of the issues start. Not only are we reluctant to say good things about our lies, but we focus on what is wrong. If this were just in our interactions with the people we come in contact with, then that would be one thing. The problem is that it is what we say to ourselves that follows this same path and continually knocks us down. We are so willing to criticize ourselves and neglect what is good in our lives. I had a client last year that I noticed was rather negative in her language. I asked her about this. She of course said she is the most positive athlete I would meet. I asked her to do this little exercise. If you catch yourself saying something negative, then write it down. At the very least make tally marks. Five days later she walked somewhat sheepishly into my office. I said what’s up and she pulled out ten pages of notes on all of the negative things she said about herself. It is sometimes a tough enough world as it is without our being our own worst enemies. Back to bragging rights. 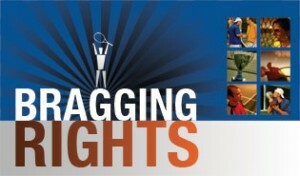 When an athlete visits with me the first thing I tell them it is time to do an exercise called bragging rights. They need to tell me only the good things that happened during the time between visits. For many this is difficult. Not only are they negative, but they were taught it’s not polite to brag. Eventually we get there and after a while they become used to it. We examine the good things that are going on in their lives, before we ever put the magnifying glass to any issues they are dealing with at the time. Not only is this a great icebreaker, but it is very helpful for the athlete to measure where they stand. So because this can be difficult (especially for those that know me well) I point the lens in my own direction and will briefly talk about the great things that have happened in the last year or so. Finished my book “The Athlete within You” – took 32 years. You have to read it to understand why. Was contacted by a former client “a decathlete” I trained preparing him for the 1980 Olympics. We had not talked since 1981. I made some really good friends this year. Kindra, Jon, Tiffany, DJ, Marg, Deb, Don, Ken, David and Lo. I was contacted by the GM of the Cheyenne Stampede to work with the Jr. A Hockey team. The GM is a former student of mine from the University of Wyoming. He remembered me, if not my name. Another former student did remember my name and told him. I was one of her favorite teachers. This is 1985/86. I can’t list all of my clients that have had great experiences as it requires more detail, but I will soon. I’ve been rather pleased with their success. In the last year I taught myself to make websites (I now have 6 or 7) and take care of way to many computers. So you see, if I can do bragging rights, anyone can. Why not take some time today and tell someone, some of the good things that are going on in your life. There is plenty of time to whine later. If you are an athlete or coach, this is one sure way to start you on the path towards peak experience.